Today you have entered in a new phase of your life. College life is one of the most exciting adventures of life. You understand more of yourself and about your capabilities. This life gives you freedom as you are at your own from now on wards. Study is going to be more difficult. Your responsibility and workload would also increase, but you have to be strong. Besides being full of hard work it also contains much of entertainment. There would be events like plays, festivals, debates, sports competitions, bonfire and much more fun activities. You would be having a great faculty and teachers. This is your time now, you are going to take decision of your future career. Decide your path and work hard to achieve the destiny. Rise above all and make history. A very good evening to, Worthy Vice chancellor, Respected Dean of department, Chairmen, Teachers and our juniors. I am _________ from ___________. I would like to say a warm word of welcome to all of you as we are going to celebrate welcome party for freshers. Tonight is an exceptional evening with the glimpse of joys, laughs and happiness. It is not the day when we wear casuals, sit quietly and listen to teachers. No!! It’s the day newcomers were waiting for, it’s the day for seniors who were waiting to welcome their juniors. Yes, it is the day when teachers stand by students and cute clicks are captured. It’s the moment when beautiful memories of the first event of an institute are attended by freshers. Tonight excitement is at its peak, where all are together and are amused to see each other. I am glad to see that many of you are able to join us, and who are not present here, they are going to miss it. Tonight is all about celebrations. Let’s capture some magical moments, create happy memories and surround ourselves with laughter and friendship. Don’t be a stranger to anyone anymore. I often think about the time, the time which comes to everyone. Yes! It is ‘Where I will go after my college? Many of us do not know what to do and where to go. In which institute we will be able to get further education? What kind of people will be there? What sort of faculty will be available? If I talk about myself I always thought that May I be able to make friends? These are some questions which arise in the mind of most students. But what when we are here? You are inside the institute where you are going to study for a long period of time. From where you are going to be graduates, from where you are going to get your degree. Juniors! You are here now as three years back we were! You can get to know about all the skills required in reaching your goal takes commitment and determination and I would like to welcome you all to take up that challenge in the long journey of learning. You will take esteemed lectures here about which you will be privy too. Here the journey begins of your career, your future and your life. It was my pleasure to be here and share my views. I on behalf of our _________ (department) want to officially welcome junior batch of ______ (year) in ________ (university/college name) family. From now on wards you guys are a part of us. I want to pay gratitude to our ____________, for providing all of us this exceptional platform. Now, I want the function to be officially started. Superb. ..Thank you very much…. I wanted this. I wasn’t get it from any other site and finally I come to this page and I got my desire thing. Thank You so much…. 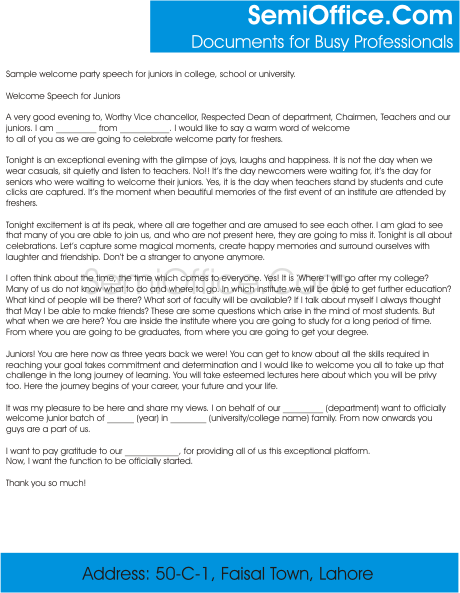 I want know how to write a speech.